Avicenna’s Class IV High Power Laser is NOT a Class III, “cold laser” or a Low-Level Laser Therapy (LLLT/Low Intensity Laser Therapy/LILT, Cold Laser) device. It is a high-power, therapeutic laser with the ability to stimulate accelerated healing energy within a continuum of treatment depths from superficial to extremely deep (6-9 inches). This enables the accelerated treatment of superficial injuries, sprains/strains, and deep intra-articular tissues (inside of joints) unreachable by any other physical therapy modality, Class III “low-level“laser or even other Class IV lasers. In the last decade the goal has been to increase the dose and power density in order to achieve better outcomes. Avicenna’s Class IV laser technology delivers 1500 times more power over a treatment region that is over 250 times larger compared to the best selling US Class III Therapeutic Laser. Additionally, it also penetrates this healing energy at 10 times the depth below the skin, which allows it to penetrate deeper into the joint than any other therapeutic modality. 1. Are known as low-level laser therapy (LLLT), cold laser therapy and low-power laser therapy. 2. Are promoted as an effective way to produce analgesia and accelerate healing of a variety of clinical conditions. 3. Use irradiation intensities that induce minimal (if any) temperature elevation (not more than 0.1-0.5° C). (This minimal elevation restricts treatment energies to a few J/cm2 and laser powers to 500 mW or less). What is Class 4 Laser Therapy? It is a non-invasive light energy that creates bio-restorative effects on a cellular level to injured or irritated tissues in the body. It is a non ionizing energy and only effects areas of the body where cells are under stress (i.e. injured); it does not have any effect on normal healthy cells. How long has laser therapy been around and how safe is it? Since the inception of laser therapy in the 1960’s there have been no reported side effects in any patients and there have been over 3000 research articles on the benefits of laser therapy. Laser Therapy is safe, noninvasive healing light energy. What it Class IV High Power Laser Therapy (HPLT)? HPLT is a painless, safe, side effect free treatment for the relief of Neuro-musculoskeletal pain. There are many studies that show the effectiveness of laser therapy to promote rapid healing of a wound or injury. HPLT is a technological advancement to the older Low Level Laser Therapy (LLLT) or Cold Laser Therapy as it has the ability to deliver vastly larger amounts of healing light energy to much greater depths of penetration as well as being able to treat a vastly larger surface area than its predecessors. Does Class 4 Laser Therapy hurt? 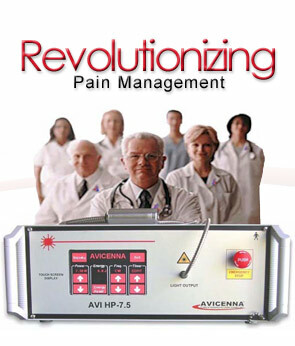 What makes Avicennas High Power Laser Therapy the best laser on the market? With 6-9 inches of penetration, 7.5 Watts of power, and a patented divergent treatment beam 1-3 inches in diameter, it is able to penetrate deeper with more power than any other FDA cleared Therapuetic Laser on the market thus yielding better and quicker outcomes. How long are the Laser Therapy treatments? Treatments usually last 5-15 minutes per site and treatment protocol is finished when the treatment goals have been met. 2. Quantitative measurement of range of motion, mobility and function. 3. Improvement in quality of life, energy and activity levels, sleep patterns, etc. 4. Eliminating the need for pharmaceuticals and/or surgical intervention. Pain can affect every aspect of your life. In its early stages, it is common for people to ignore pain or discomfort. As the condition progressively worsens exercising, walking, sitting and standing can become challenging and painful. If you suffer from pain or limited mobility, we encourage you to explore Class IV high power laser treatment options to help regain your highest level of function. Our recommendation is to seek the medical advice of a physician who, after a physical examination, can give you the appropriate advice about the management of your medical condition. If you are considering a non-surgical, non-drug approach to treating your pain, Avicenna HPLT can help. A recent review of over 3,000 articles in medical journals indicates that many acute and chronic conditions may be improved or eliminated through the use of high power laser therapy.